I'm trying to write my new novel "Return to Sky" which means I need hair clips to hold back my growing-out bangs (I chose ones with goldfish to bring me luck!) and candied ginger. 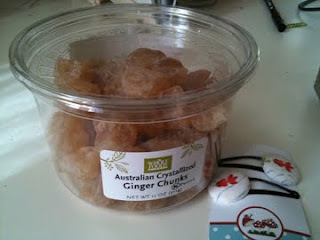 All my novels have been fueled by a steady ingestion of candied ginger. I usually eat the Trader Joe's brand but for some reason my local Trader Joe's has been sans candied ginger lately...which means I've resorted to Whole Foods and their expensive Australian version. Sigh. Hopefully, this will at least last me a chapter or two!